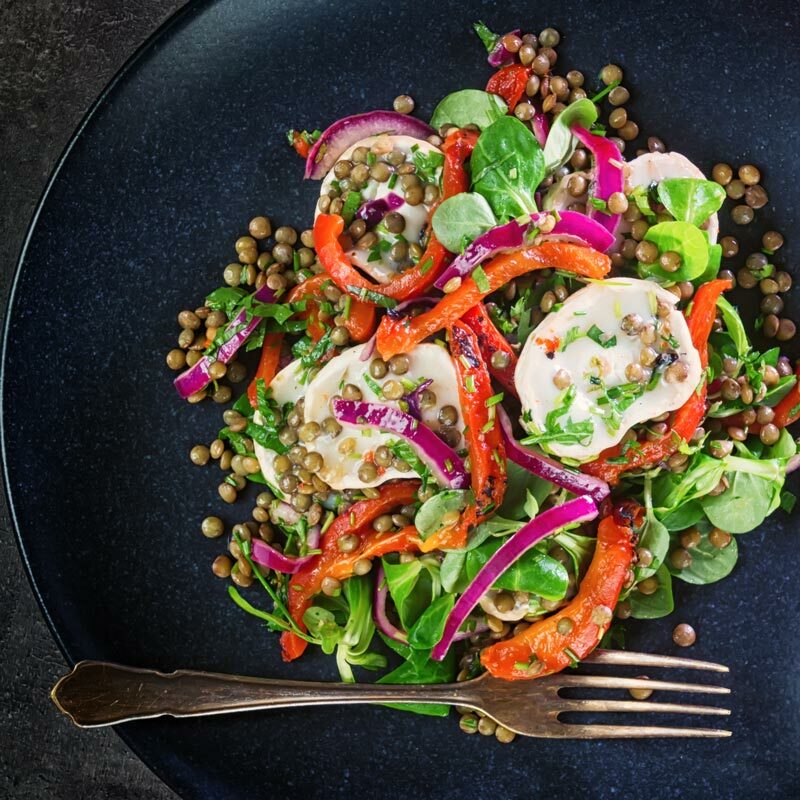 This delicious puy lentil salad is loaded with gloriously salty, fresh, soft goats cheese and wonderfully sweet roasted red pepper! Puy Lentil Salad With Goat Cheese and Roasted Peppers. 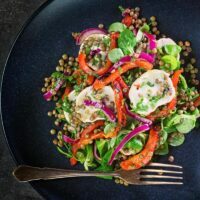 This Puy Lentil Salad is a little different to many of my ‘salad not salad recipes’ that I usually create. It is probably a little more recognisable as a traditional salad in many ways… Anyway, whatever it is it is a recipe I deeply love. The salty acidic goats cheese is perfect against the sweet roasted red peppers. We then add the red wine vinegar, a little good quality olive oil and herb to round out the flavour. All of which marry with the almost peppery flavour and texture of the puy lentils perfectly. Regular readers will know I have a thing for goats cheese, I love it, apparently, some people don’t… Those people are very strange! Like my goats cheese risotto and my deep fried goats cheese recipe, this puy lentil salad recipe uses young soft goats cheese. It is a little milder than aged goats cheese with a little more acidity. It is also beautifully creamy which compliments all the other textures in this lentil salad perfectly. I secretly know why you are all here though… Potted food history lessons in a few words. Anyway your food general knowledge for today concerns lentils. Apparently, lentils are the oldest pulse crop that we know of, forget your peas and beans. Lentils predate them with dateable evidence of their consumption dating back some 13,000 years! 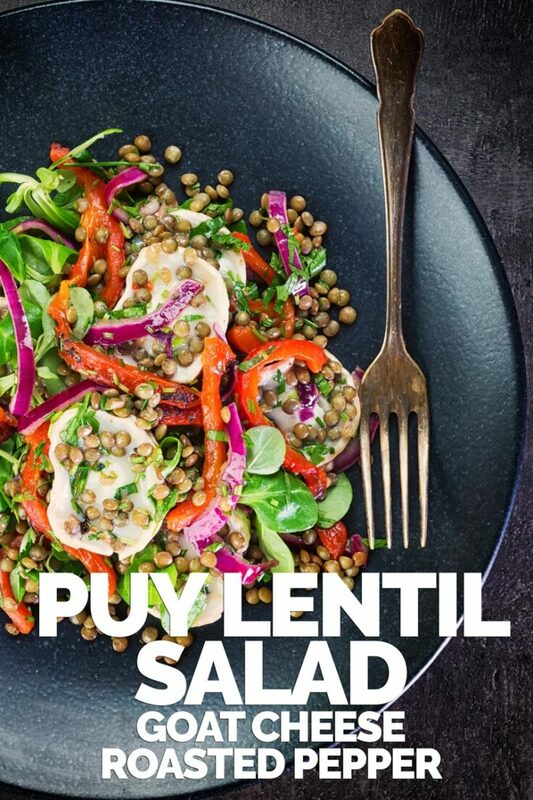 Anyway enough of the history, this lentil salad recipe uses Puy Lentils. They are from the Auvergne region of France. They are prized for their almost peppery flavour and the texture they keep after cooking. You know me texture in food is really, really important, as far as I am concerned as important as flavour! If you cannot get puy lentils then avoid yellow or red lentils as a substitute. They go too mushy, perfect for this Lentil and Bean Burger but pretty crappy for this puy lentil salad! Go for brown or green lentils as a substitute for puy lentils but adjust the cooking time as per the instructions. Lentils are a wonderful ingredient although in recent times they have picked up a bad ‘rep’ from the hippy crowd in some Western cultures. In all fairness, I probably consider myself at least an associate member of the hippy crowd. 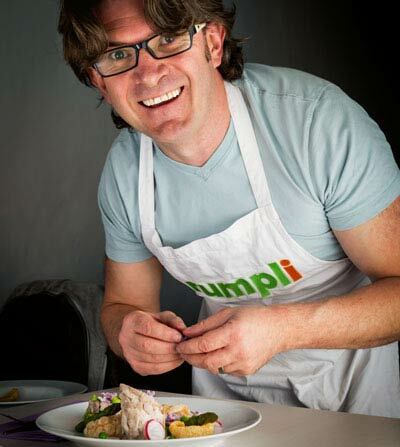 But if lentils are not part of your store cupboard, then give yourself a talking to and sort it out! 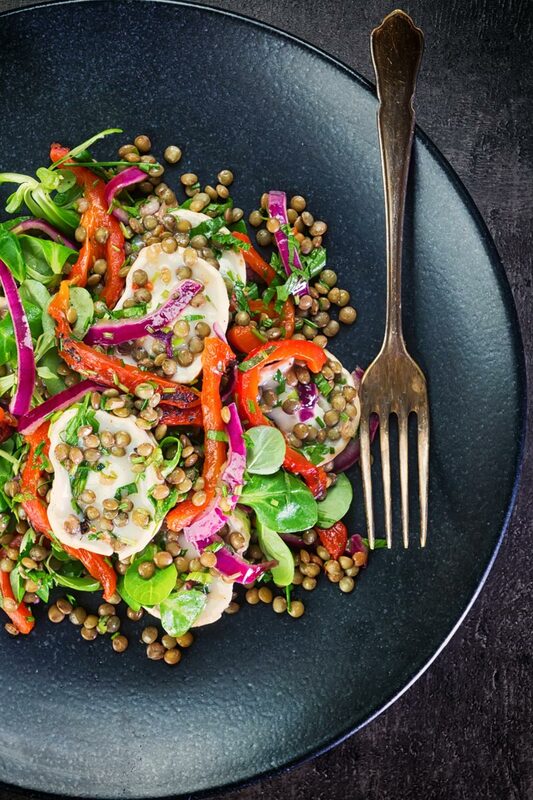 They are however fabulous in curries, stews, casseroles, and soups as well as in salads like this puy lentil salad. Or indeed the lentil salad accompanying this glorious herb crusted salmon recipe. Of course, let’s not forget the glory that is Dhal, the beautifully simple Indian favourite! But don’t take my word for it, go out and cook them they are incredible. There are also probably a host of health reason too, but hey you know I care nothing for that. Eat em because they taste bostin’! 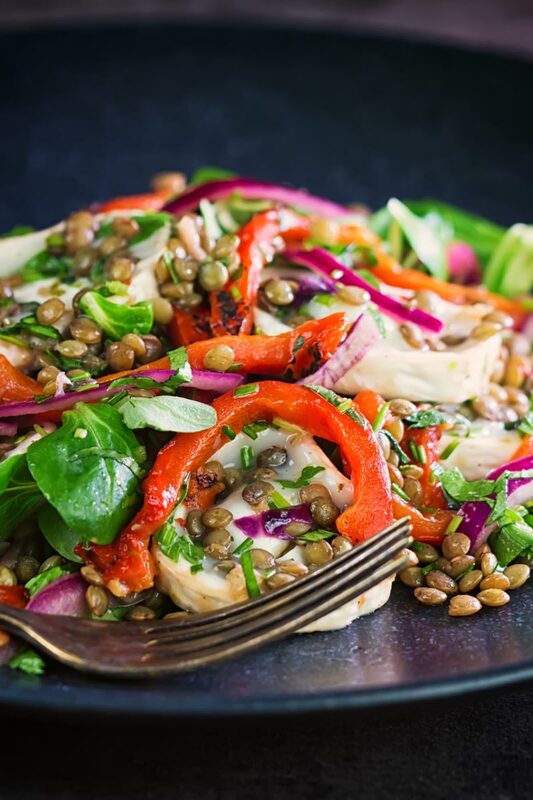 My puy lentil salad makes for a fantastic hearty main course salad. It features soft goats cheese with roasted red peppers and is a real treat! Heat your oven to 220°C or 430°F and roast off your red pepper for 30 minutes. After 10 minutes bring a pan of water to the boil and add the bay leaf and small onion (cut in half). When the water boils reduce the temperature and add the lentils, bring to a gentle simmer and cook for 25 minutes. Remove the pepper from the oven and then cover with cling film and allow to set for 5 minutes. Slice your red onion and sprinkle with sea salt and then mix in the red wine vinegar and allow to sit for 3-4 minutes. By now it should be time to drain your puy lentils, discard both the onion and the bay leaf and place in a bowl. Add in the onions along with the red wine vinegar, the olive oil, and a generous seasoning of sea salt and pepper. Cover and allow to cool for 10 minutes. Whilst the lentils are cooling you can now remove the skin from the pepper and tear into shreds. Make sure you keep any juices from the pepper to add back into the salad. Finally mix everything together including herbs, salad leaves and of course your sliced goats cheese and serve. I honestly just bought lentils and didn’t want soup you just made me so happy posting this salad and I am going to make this today except I only have feta or blue cheese in the fridge so I will sub that ! thanks !!!! I’m on team goat cheese too! It’s so good with lentils! 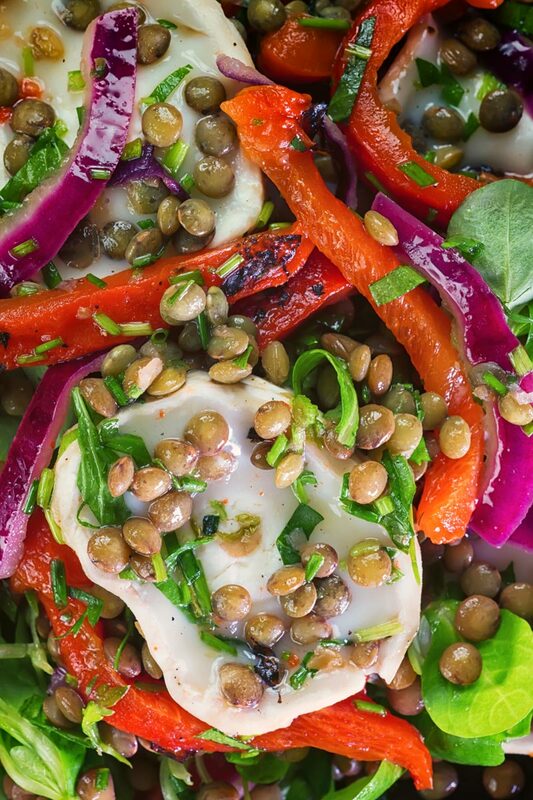 I’ve never added roasted peppers to my lentil salads but now I need to, this looks fantastic. Lentils make such a hearty salad and anything with goats cheese is good with me! This looks and sounds like a delicious salad. I don’t make dishes with lentils anywhere near enough, I really need to change that. Will have to give this tasty salad a try.